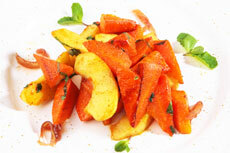 Apples and carrots are a wonderful combo that is a welcome addition to a holiday buffet. Honey and cinnamon provide sweet and savory notes, without the overdose of added sugar so often found in the traditional sweet potato-brown sugar-marshmallow casserole. Preheat oven to 350 degrees. Line a baking pan with foil or parchment paper. Toss all ingredients together and place in a single layer in baking pan. Roast 25-35 minutes, until lightly golden and tender, stirring occasionally.